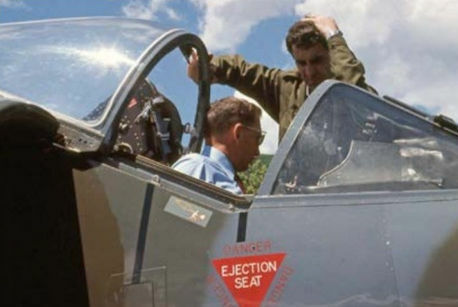 John Farley demonstrates the Harrier cockpit to a Swiss Air Force pilot. The air arm comprised a mix of professional personnel and part-timers, the ratio being about a third full-timers to two-thirds reservists, with some 800 aircraft of various types on strength. 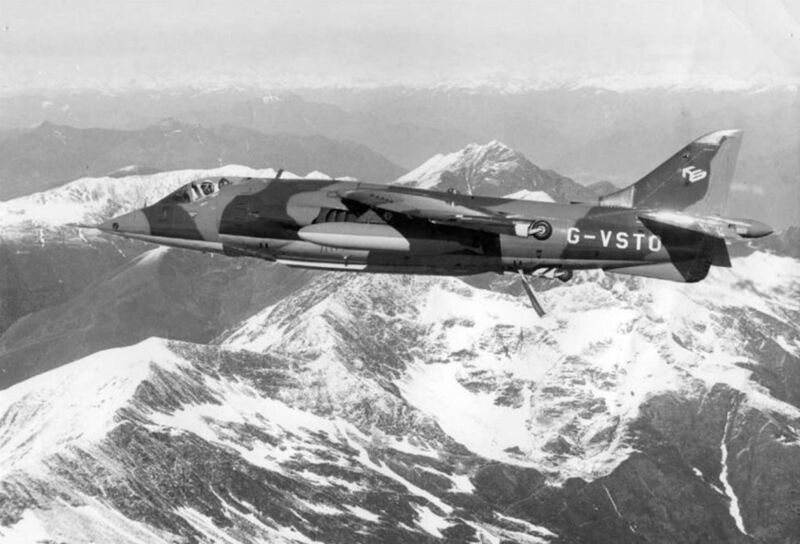 With Switzerland’s mountainous terrain, and airfields embedded in deep valleys, the Harrier appeared to be a natural choice for the nation’s air force - but the remarkable V/STOL fighter did not qualify for inclusion in the procurement process, according to Switzerland’s rather odd production cut-off stipulations. 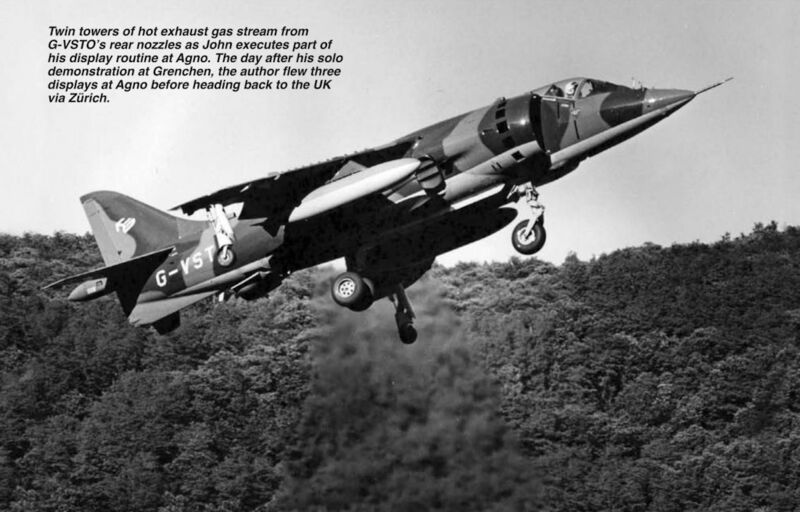 Harrier GR.1 XV742 was lent to Hawker Siddeley by the Ministry of Defence for its demonstration tour to Switzerland in 1971, for which it had to be given a civil registration - resulting in the out-of-sequence but appropriate G-VSTO. 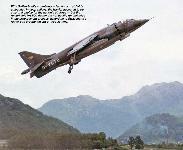 Here John Farley positions the Harrier over a magnificent Alpine background to be photographed from the company ’s HS.125. 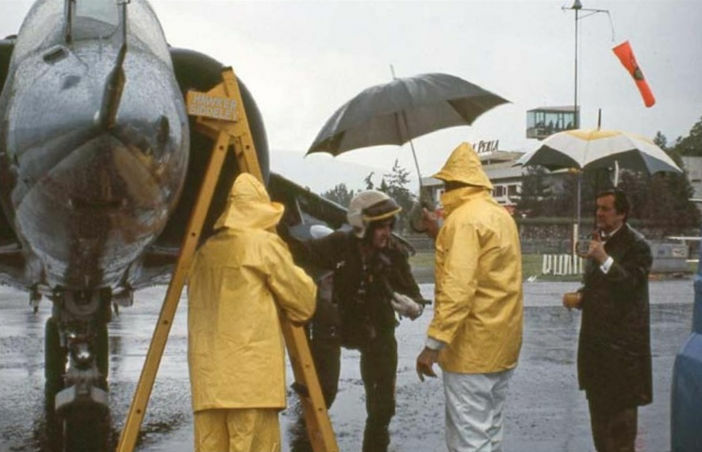 John Farley performing his dynamic and very carefully worked-out demonstration at Agno airfield on June 11, 1971. The view from the top of what came to be known locally as “Monte Farley” after the Harrier display. 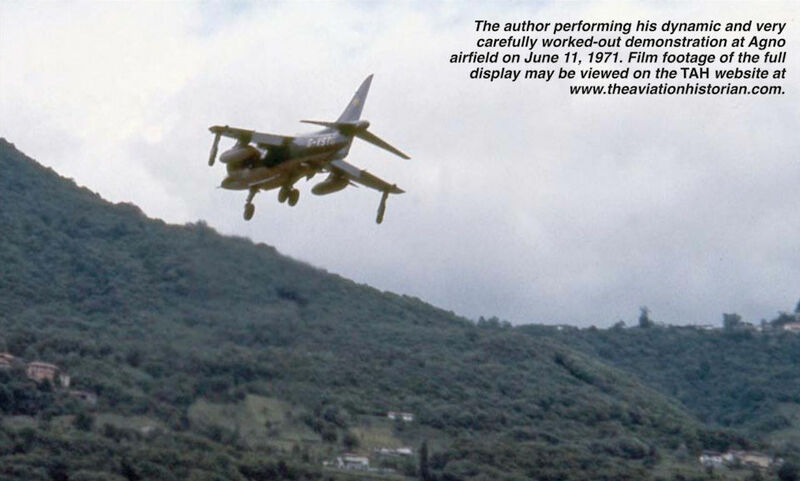 With a steep mountain directly beside the runway, Agno was the ideal environment to display the Harrier’s V/STOL capabilities. 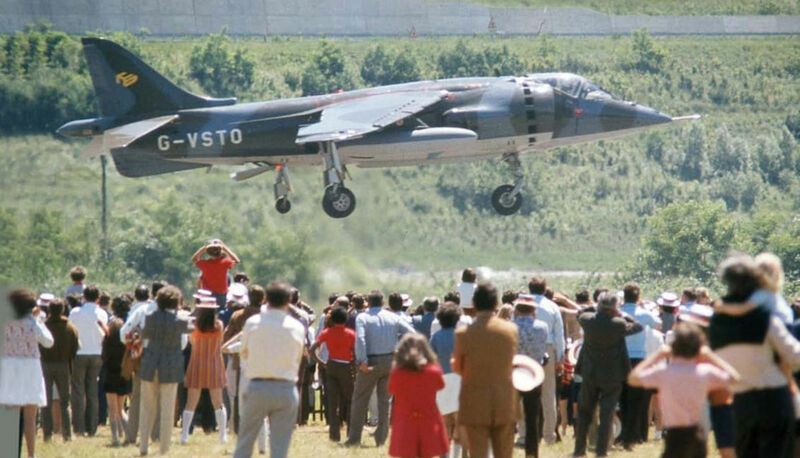 The Harrier was displayed at Agno as part of Switzerland’s 1971 International Salon d’Aviation. 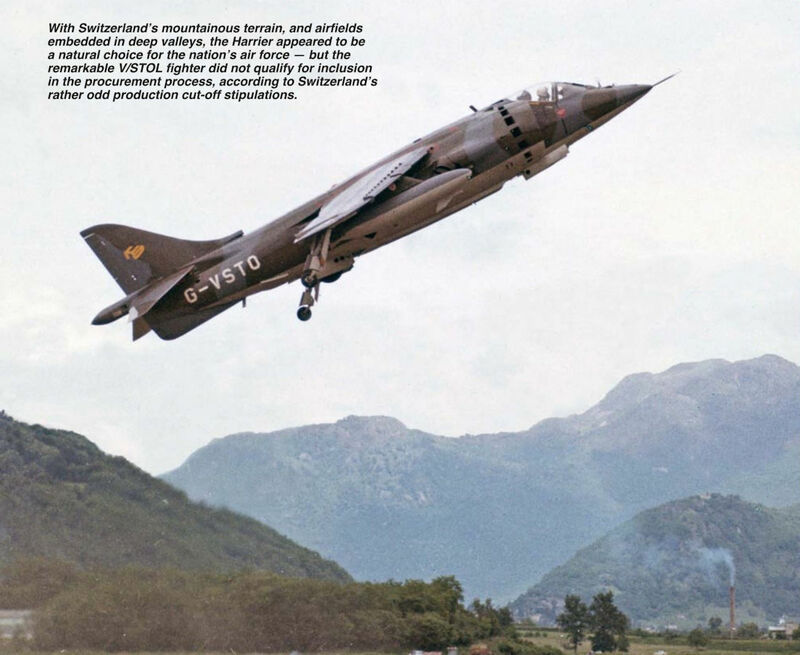 The airfield, five miles south-west of Lugano, offered a runway 4,000ft (1,200m) in length and 100ft (30m) wide, the mountains surrounding it providing a natural amphitheatre, which the author exploited to the full. On June 12 the Harrier was due to display at a show at nearby Grenchen. 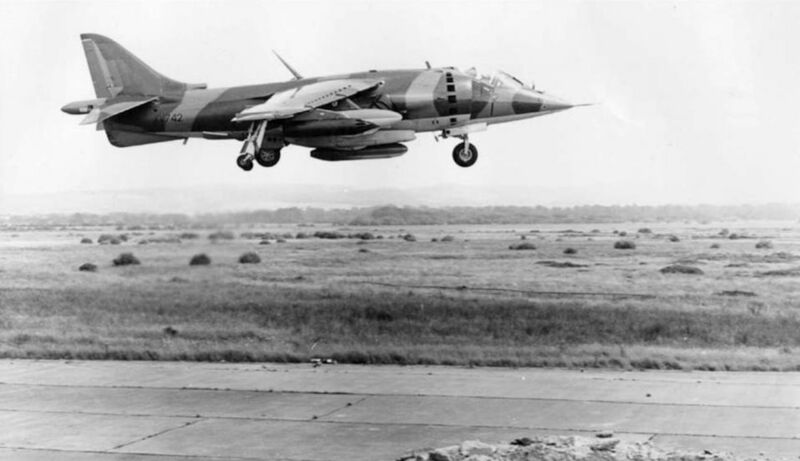 Although the show was cancelled owing to bad weather, the author nevertheless performed two display flights there in the Harrier - the only aircraft to do so. 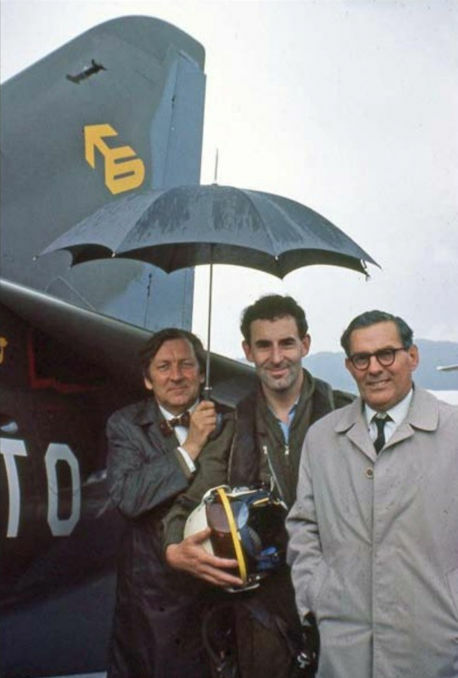 John Farley (centre) beside G-VSTO on a drizzly day in Switzerland in June 1971 with Hawker Siddeley Marketing Manager Bill Bedford (left) and Air Cdre Eric Burch more CBE, who, in 1968, was appointed to lead the project to introduce the Harrier into RAF service. Bedford had been the test pilot for the first flight of the P.1127, forerunner of the Harrier. Twin towers of hot exhaust gas stream from G-VSTO’s rear nozzles as John executes part of his display routine at Agno. The day after his solo demonstration at Grenchen, the author flew three displays at Agno before heading back to the UK via Zurich. 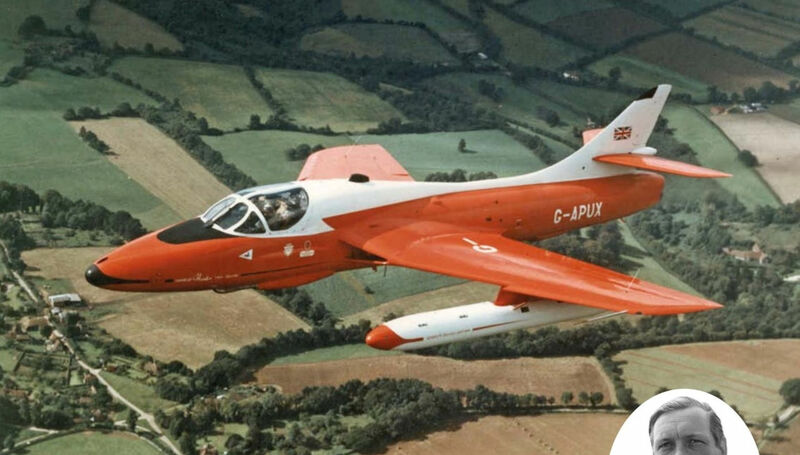 With airbrake fully deployed, the author brings G-VSTO alongside the HS.125 the company used as a support aircraft. Note the 100gal fuel tanks the Harrier carried throughout the tour. During the excursion to Switzerland G-VSTO made a total of 13 flights with virtually no maintenance other than filling up with fuel. As well as making the trip to Switzerland as G-VSTO in 1971, XV742 was used the same year for trials on the deliberately-cratered runway at West Freugh in Scotland, to evaluate the type’s ability to operate from a heavily damaged airfield. 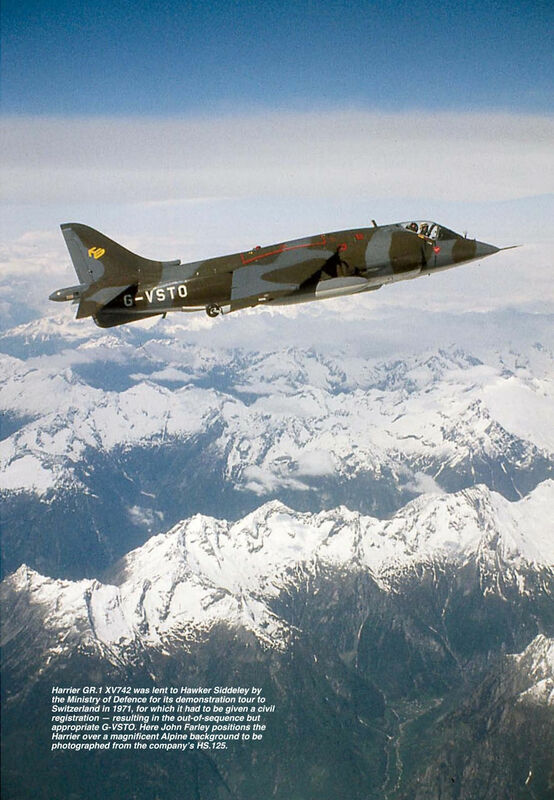 The aircraft was lost during a weapons exercise while serving with No 233 OCU in October 1983.